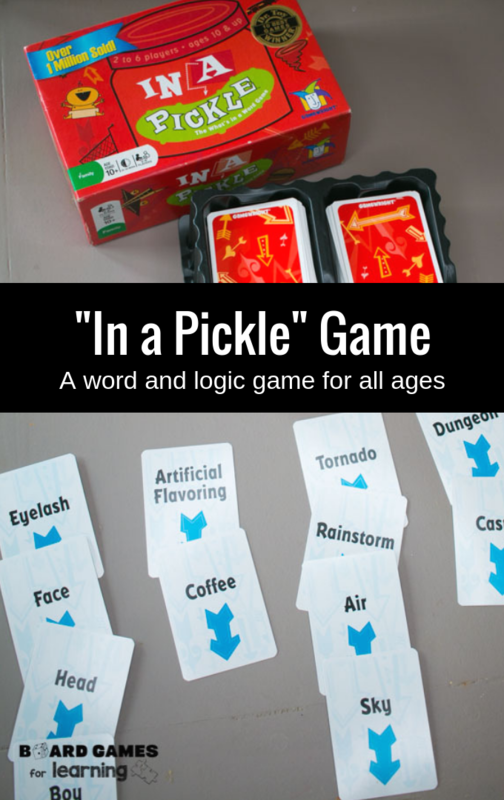 As a way to work on reading words without context clues, we bought the In A Pickle game to practice and learn. So even though the box says 10+ it’s still a great resource for younger kids who are working to master the mechanics of reading. This great card game is also technically a puzzle game and a perfect way to work on helping kids understand the world and word associations. Subjects or Learning Objectives 📚 Critical thinking and Logic, Vocabulary and application of words, comparison of words, objects, and phrases. Have students use a pencil and paper to write down any words they come across that are new and/or difficult. Use each completed set of 4 as a writing prompt. Have students write a brief overview after the game as to one set that got “blocked” from them placing a card they wanted to play and/or how a set turned out differently than they expected. Let me FIRST say that we will most likely rate it higher as time goes on, but right now at my kids’ ages, it’s more challenging than it is fun. Which is not a bad thing at all. 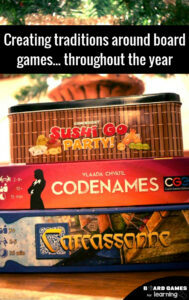 But as a family game or something super enjoyable in the classroom, it would be a bit lacking. 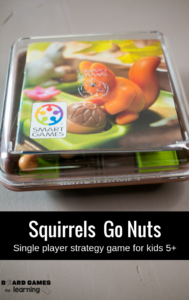 Otherwise, it’s a great game to get kids thinking logically about how things relate to each other in terms of size and also really helps with reading and vocabulary building. 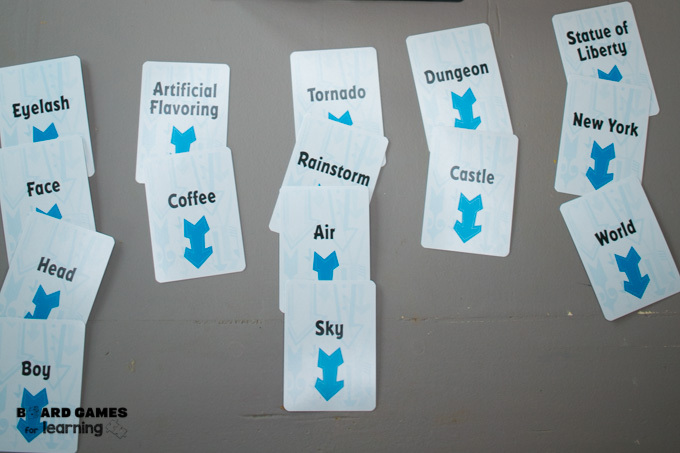 The point of the game is to make sets of four putting a card that is “bigger” on top of something “smaller”. While I have never fully gotten it out of the rule book, a house rule for us at least is that not only does it have to be bigger, it has to relate to the whole word set. Below you san see where for instance an eye lash is on a face is on a head is on a boy. Therefore for us, even though say a castle is bigger than an eyelash, we wouldn’t accept it. This is because our brains work at memorizing and learning by making connections. SO if my ultimate goal for the student is to learn, especially if exposed to new words or ideas, then I want the connection to be there. This was why we introduced the game to our five year old. If a child can really and truly read, then they can sound out words they have never seen before, do it without context clues, and have the understanding to know what it is. 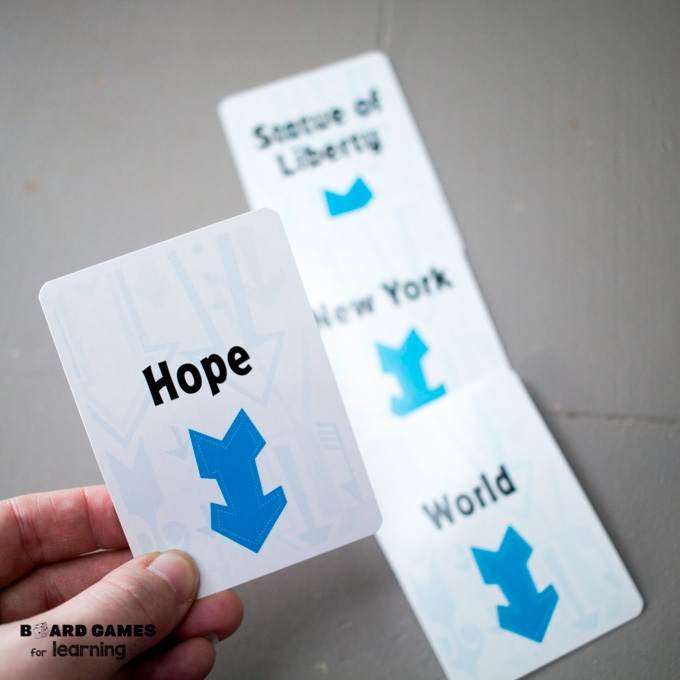 In this scenario, if someone was playing the card “hope” and the words Statue of Liberty > New York > World were in play and I played it, someone might say that I was wrong because the Statue of Liberty contains hope. But in another view hope is larger than anything in the world. Sometimes kids will encounter words they don’t know in which they will learn the definition. [This is a great case for having pen and paper ready so they record all the words that are unfamiliar]. But in general, kids need to know the meaning of words and more than just meaning but be able to apply not just what it is but their characteristics as well to be able to play. Teach your kids about Analogies with this song and video. Join other tabletop teachers & parents! Join our community and newsletter for updates, offers, and more!